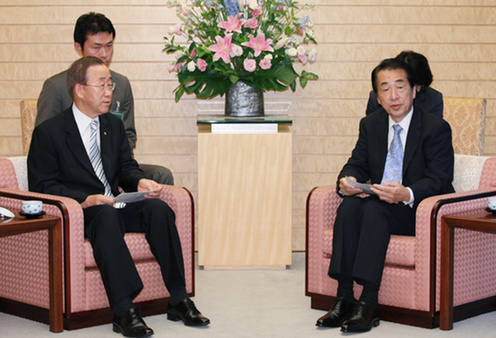 On August 4 (Wed) from 6:00 p.m., Mr. Naoto Kan, Prime Minister of Japan, held talks with Mr. Ban Ki-Moon, Secretary-General of the United Nations for around 30 minutes, followed by brief remarks to the press for around 20 minutes. The overview of the meeting is as follows. 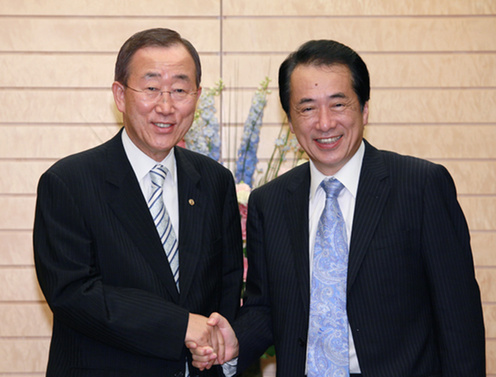 At the start of the meeting, Prime Minister Kan heartily welcomed on behalf of the people of Japan Secretary-General Ban’s visit to Nagasaki as well as his attendance at the Hiroshima Peace Memorial Ceremony as the first Secretary-General of the United Nations to attend the ceremony. Secretary-General Ban stated that through his attendance at the Hiroshima Peace Memorial Ceremony he would like to send a strong message to the international community, and give a new momentum toward the realization of a world free of nuclear weapons. On the subject of development, Secretary-General Ban requested Prime Minister Kan’s participation in the High-level meeting on the Millennium Development Goals (MDGs), which will be held during the United Nations General Assembly in September. Prime Minister Kan responded that he would do his best to participate in the meeting despite issues of domestic politics. Secretary-General Ban expressed his gratitude for Japan’s official development assistance (ODA) and its assistance to the United Nations, and indicated his hope that these assistance efforts will continue. He also requested for Japan’s contribution to the 3rd replenishment to the Global Fund. In response, Prime Minister Kan said that Japan will cooperate as much as possible in spite of its difficult financial situation, in light of Japan’s prosperity being maintained in the context of world peace and will consider the replenishment to the Global Fund as well. Concerning peacekeeping operations (PKO), Secretary-General Ban thanked Japan for its personnel contribution to PKO in Haiti, and indicated his expectation for the dispatch of helicopters to other PKO missions. Prime Minister Kan responded that although it will be difficult in some regions given certain limitations, he will consider the possibility of going forward. On the issue of North Korea, Prime Minister Kan thanked Secretary-General Ban for his cooperation in dealing with the incident of the ROK’s Navy Vessel, and requested cooperation also toward resolving the nuclear issue and the abduction issue. Secretary-General Ban explained that the international community has gained sufficient understanding on these issues, and that improvement of Japan-North Korea relations will lead to regional peace.